The Atlanta Dream celebrate their series tie-breaking win over the Minnesota Lynx. Photo by David Sherman/NBAE via Getty Images. 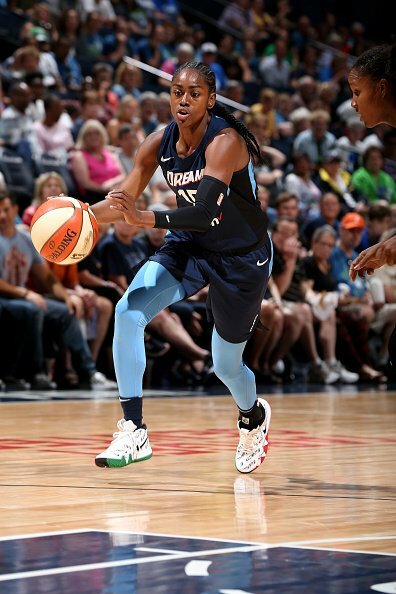 Minneapolis – The Atlanta Dream aren’t known for being three-point shooters, but they sure looked like they were Sunday. The WNBA’s No. 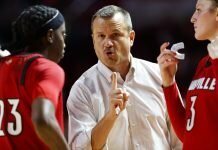 2 team connected on 40 percent of their shots from behind the arc – well over their season average of 29 percent – to pound the defending champion Minnesota Lynx, 86-66. Tiffany Hayes shot six of those treys, en route to a season-high 28 points. Alex Bentley came off the bench for 19 points for the visitors, and Angel McCoughtry chipped in 11. 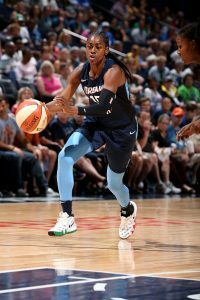 Sylvia Fowles had 17 points and 10 rebounds for Minnesota, while Seimone Augustus and Maya Moore each added 15 points. It was the first win for Atlanta at Target Center in nine years. From the opening tip, the rubber match between the the two teams looked poised to be a 40-minute battle, as the series was 1-1 with the playoff seeding tiebreaker on the line for the winner. The first quarter was back and forth, with neither team leading by more than four points the whole way. Minnesota shot 47 percent to Atlanta’s 39-38, but only Fowles and Augustus scored for the hosts. Tiffany Hayes brings the ball up court. She made six three-point shots for the Dream against the Lynx. Photo by David Sherman/NBAE via Getty Images. The script flipped in the second period, as the Dream began their three-point assault while keeping the Lynx from scoring on the defensive end. They took a 49-34 advantage into the break. Moore hit two straight baskets to begin the third quarter, which cut Atlanta’s lead to 10. 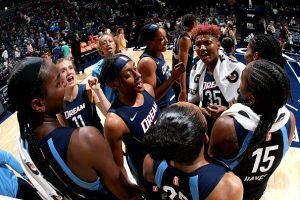 But the Dream made their shots and took advantage of the absence of Minnesota forward Rebekkah Brunson, who was fouled in the first half and was out for the rest of the game. Atlanta dominated the last period, moving the ball effectively and using a balanced attack that saw nine of the 10 players who hit the floor score. The Dream are now 18-10 and have won two in a row, after seeing their eight-game winning streak snapped last week. The loss was the third straight for the Lynx, whose season has been uncharacteristically up and down. Coach Cheryl Reeve said top scorers Fowles and Moore need to step up their play. As in Minnesota’s previous two losses, their opponents out-hustled them down the stretch. Moore seemed at a loss for words when asked what the team needs to do to get over the hump. Fowles was just as somber, pointing to the basics of executing and doing the little things in order to win a game, and noting the team’s failure to get wins as the regular season draws to a close. 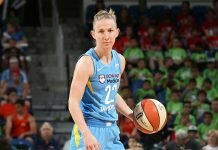 Though Fowles finished with her league-best 17th double-double of the season, Reeve said the veteran center is reactive and needs to remain focused. Atlanta now returns home for a three-game stand, while the Lynx hit the road for two match ups.